Hello and welcome to stage 4 of the Tour of Algarve. Today's largely flat stage runs 198.3km from Albufeira to Tavira. Yesterday's time trial saw Stefan Küng take the win, his first for his new team Groupama-FDJ. Race leader going into the stage, Tadej Pogačar (UAE Team Emirates) put in a surprisingly strong effort to take fifth on the day and extend his lead in the general classification. Pogačar and second place man Enric Mas (Deceuninck-Quick Step) are now separated by 31 seconds, though today's stage shouldn't pose a challenge for the men at the top of standings, with a sprint finish looking likely. Marcel Kittel, André Greipel and Dylan Groenewegen have triumphed on stage 4 in the past three editions of the race, with each stage seeing the same run-in and finish as today. Jumbo-Visma's Groenewegen will be among the favourites today. The Dutchman was caught up in a crash 7km from the line on stage 2, thus missing out on the anticipated mass sprint. And we're off! The stage has just gotten underway. The peloton is all together after 4km of racing. There were two non-starters today – Davide Martinelli (Deceuninck-Quick Step) and Julien Vermote (Dimension Data). Five riders are on the attack, all from local Continental teams. They are Luís Fernandes (Aviludo-Louletano), Nikolay Mihaylov (Efapel), Jesús Nanclares (Miranda-Mortágua), Fábio Costa (UD Oliveirense/InOutBuild) and Oscar Pelegri (Vito-Feirense). The group has an advantage of 1:10 on the peloton. The time gap has grown quickly and the break now have an advantage of 5:30. A crash in the peloton, but it doesn't seem to be anything major. Amaro Antunes (CCC Team) is among those held up. 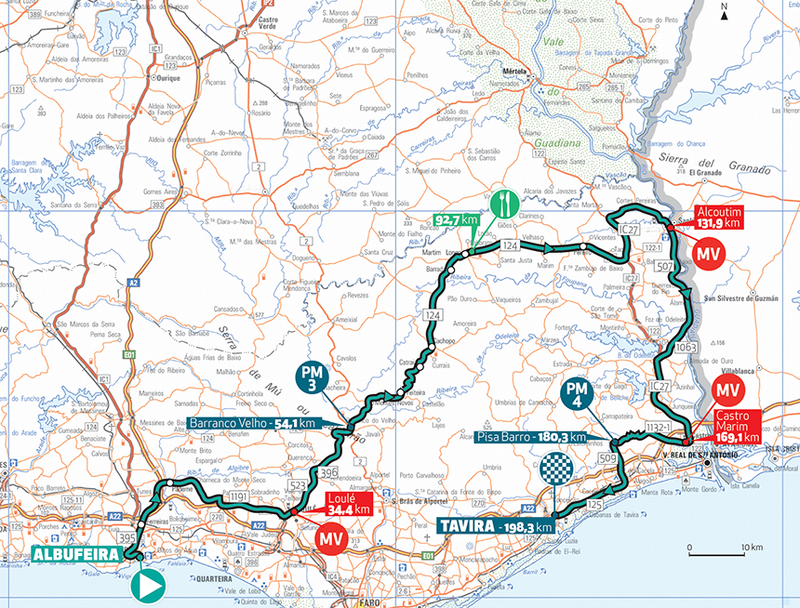 The map of today's stage, with the race heading inland before finishing in the coastal town of Tavira. 9km from the first intermediate sprint of the day in Loulé and the break's advantage is still edging up. It's 6:25 now. The first climb of the day is up in just under 20km. It's the third-category climb of Barranco Velho. The gap to the break has stabilised at around five minutes for now. There's a bit of a plateau for the riders now, before a long and gradual descent to the feed zone in 38km and then the second intermediate sprint at Alcoutim in 78km. The gap from the peloton to the break is down to 3:35 now. Still the same five riders in the break. There was a bit of separation at the top of the climb but they quickly got back together. An average speed of 37km/h over the first two hours of the race. The break's advantage is gradually being eroded. It's now just under three minutes. They'll still be out there for some time, but the peloton are keeping them on a tighter leash. Well, the latest time check has the advantage back up to 5:10, so scratch that. Deceuninck-Quick Step are among the teams working at the head of the peloton. No surprise given that they have stage 1 winner Fabio Jakobsen for the sprint. He'll be competing for his second win of the season in around 90km. Arnaud Démare's Groupama-FDJ are also up there. I'll round up the other likely contenders for today's stage win soon. The latest time gap reported was 2:15. It's up and down at the moment, probably related to the recent feed zone and then Quick Step and FDJ upping the pace. Over at the Vuelta a Andalucia, Simon Yates (Mitchelton-Scott) went for a solo attack on the final climb of the Alto de Hazallanas. A chase group including Steven Kruijswijk (Jumbo-Visma) and Pello Bilbao, Jakob Fuglsang and Ion Izagirre (all Astana) is 35 seconds in arrears with 5km of flat/downhill road to go. Meanwhile, Clara Koppenburg (WNT-Rotor) has won stage 3 of the Setmana Ciclista Valenciana at Castalla (Xorret de Catí). 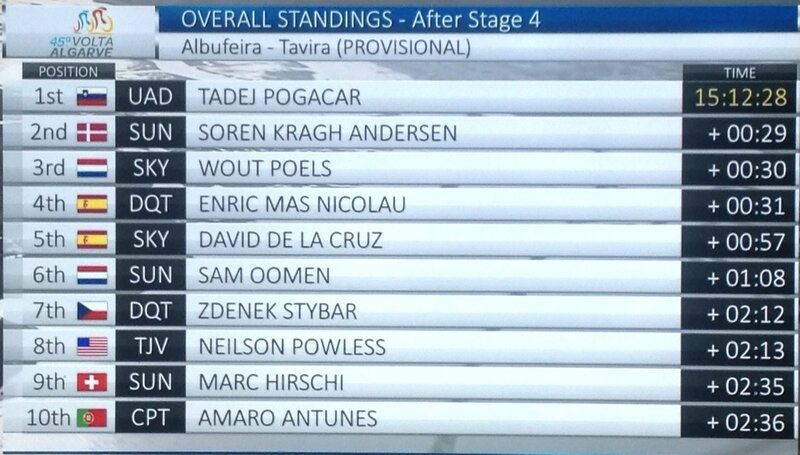 It's still the same situation at the Volta ao Algarve, by the way. Simon Yates duly takes the win on stage 3 of the Vuelta a Andalucia, his first victory of the season. It looks like Fuglsang will take the race lead. 1:45 for the break now as FDJ and Quick Step continue to work. The break are close to the second intermediate sprint at Alcoutim now. FDJ and Quick Step are still working at the head of the peloton, with the time gap hovering around 1:45. There's around 35km to go until the next (final) intermediate sprint at Castro Marim. Then another 11km until the fourth-category climb at Pisa Barro, which comes 18km from the finish. 1:30 for the break now, heading into the final 40km. Nanclares has been dropped from the break. A crash towards the rear of the peloton takes a few riders out. Martijn Tusveld (Team Sunweb) is being tended to in a grass ditch at the side of the road. Giulio Ciccone took his first win for new team Trek-Segafredo at the Tour du Haut Var. The Italian beat Thibaut Pinot (Groupama-FDJ) and Romain Bardet (AG2R La Mondiale) on the uphill finish in Mons. A quick look at the sprint contenders then. We've already mentioned Fabio Jakobsen and Arnaud Démare. Their Quick Step and FDJ teams have been doing a lot of work on the front of the peloton so far today. Jumbo-Visma are up there now too. They're working for Dylan Groenewegen, who won a stage at the Volta a Comunitat Valenciana earlier this month. Pascal Ackermann, winner of the Clásica de Almería, is Bora-Hansgrohe's man. Meanwhile, Katusha-Alpecin have Jens Debusschere as their sprint option. Trek-Segafredo's John Degenkolb was caught in the stage one crash, while Simone Consonni (UAE TeamEmirates), Jasper de Buyst (Lotto-Soudal) and Søren Kragh Andersen (Team Sunweb) took fourth, fifth and sixth on the same stage. Pelegri and Mihaylov are alone up front now, a minute up on the peloton. Fernandes and Costa have just dropped back. 40 seconds is the gap with 25km to race. Benoît Vaugrenard (Groupama-FDJ) was third on that last intermediate sprint, by the way. Tusveld is back in the peloton after returning from his crash. The break have started the final climb of the day, the third cat Pisa Barro. It's 2.2km long with an average gradient of 3.7%. The break is caught before the top of the climb. David Ribeiro (LA Aluminios) tries to counter but is quickly shut down by Tim Declerq (Deceuninck-Quick Step) at the head of the peloton. Down the descent and the peloton is all together, led by Quick Step and FDJ. Jumbo-Visma are up front now too. Mechanical for Neilson Powless (Jumbo-Visma). Not an ideal time for it. He lies eighth overall. Danilo Wyss (Dimension Data) tries a solo move out front. He won't be out there for long though. Groenewegen has a mechanical issue too. He's dropped off the back of the peloton, and his team drops off the front to pace him back. A mixture of teams up front now, while Jumbo-Visma are moving up the side, having brought Groenewegen back safely and quickly. Final 5km now and it's Bora and Jumbo up front. Now the Groupama-FDJ train move up, led by Stefan Küng. FDJ and Jumbo are the defined trains at the head of the peloton. Most other teams have a smattering of riders up there. There's only one or two Quick Step riders up there, and not right on the front. Inside the final kilometre now! Groenewegen takes up the sprint first! Consonni on his wheel. FDJ disorganised when it matters. And Groenewegen takes the win! Démare was out of position after the final corner and wasn't close to contention. Groenewegen was fourth wheel behind his leadout man and two FDJ riders, while Démare was around eighth. Ackermann came from a long way back too. Groenewegen really took advantage of his positioning there. Jasper Philipsen was the UAE Team Emirates rider up there, not Consonni. The top three was Groenewegen, followed by Démare and Philipsen. Ackermann fourth, Consonni fifth. It's the second win of the season for Groenewegen after his win at the final stage of the Volta a la Comunitat Valenciana two weeks ago. That makes it 37 wins so far in the 25-year-old's career. "Yeah, the first stage we had some bad luck but today we took our revenge. "If we do a leadout like this then we'll have a beautiful year." 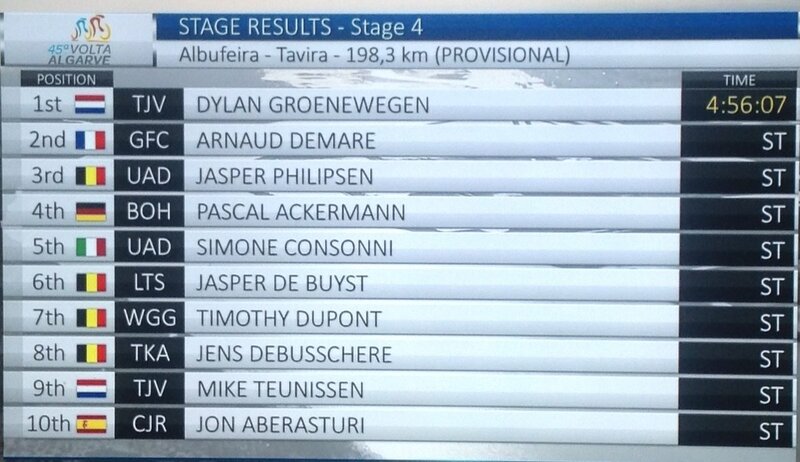 Here's the stage result and the top ten on GC. 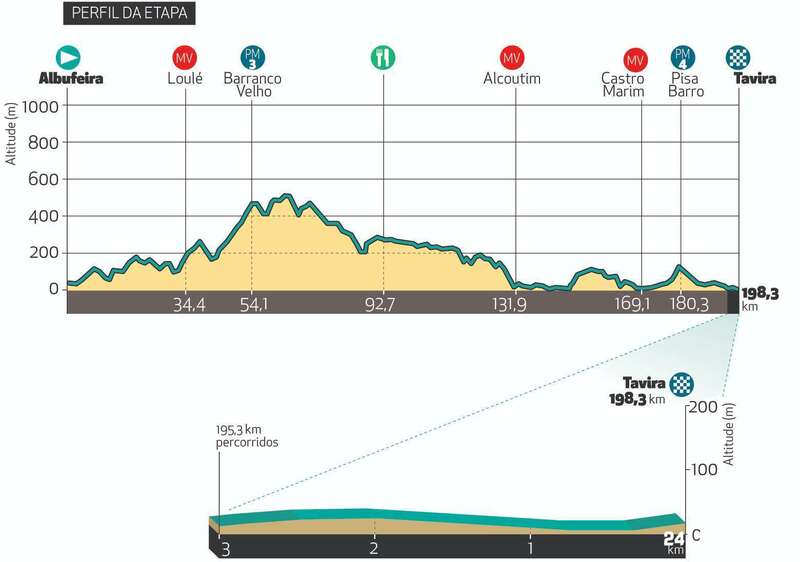 Tomorrow's final stage to Malhão will be the race decider, with an uphill finish (2.8km at 8.8%) on the cards, plus four categorised climbs on the way there. It'll be tough for anybody to overhaul Tadej Pogačar (UAE Team Emirates), who enjoys a 29-second lead over his nearest challenger. On such a short climb it'll either require the young Slovene to collapse, or for another team to ambush him earlier on in the stage. The fight for the podium is all still in play though, with just two seconds separating Kragh Andersen, Poels and Mas.